Platforms: Windows 10/8/7, and MS Outlook 2010/2013/2016/2019 (32 and 64bit) and Office 365. Microsoft .Net Framework 4.0 or later. Do you often find yourself sending sensitive attachments via email? Does your finger hover over the "Send" button as you worry about whether your document is truly secure? Wouldn't you just love the peace of mind that comes from knowing that only your designated recipient had the power to open and read your email messages and attachments? 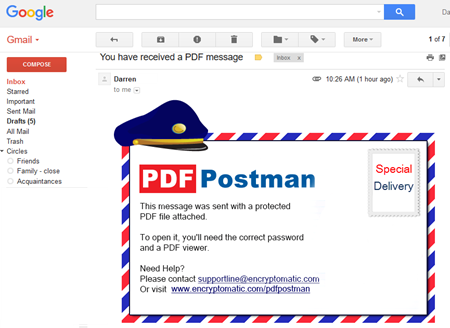 Well, today that peace of mind can be yours with a copy of PDF Postman for Outlook! PDF Postman for Outlook is an add-in for Microsoft Outlook that gives you the power to send secure email messages and file attachments as encrypted PDF files! 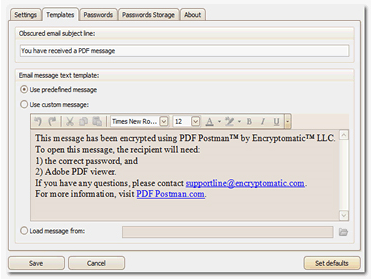 With PDF Postman for Outlook, you'll benefit from strong AES 128-bit and AES 256-bit encryption that takes full advantage of all of the security advantages offered by the PDF format. Plus, since your messages and attachments are in PDF format, it's the perfect way to exchange sensitive communications that are universally compatible with all hardware platforms. Flexibility is the name of the game with PDF Postman for Outlook! Just type your email into Outlook as usual, then click the 'PDF Encrypt Email' button on the toolbar, and watch as your email and attachments transform into secure, password-protected PDF files! You can even choose to convert only the attachments to PDF, or skip the security altogether and just convert it to an unsecured PDF file. On the receiving end, all your designated party needs to open and read your email messages and attachments is a password. That's it -- no complicated proprietary software to install, no encryption keys to exchange, no special instructions whatsoever! Plus, no matter what platform they're using (PC, Mac, iPhone, Android, or other portable device) you know that the cross-compatible nature of PDF files means they'll be able to open and read your messages! All of this, thanks to PDF Postman for Outlook! Transform your Outlook email messages and attachments into secure PDF documents. Enjoy the security of strong AES 128-bit and AES 256-bit encryption. 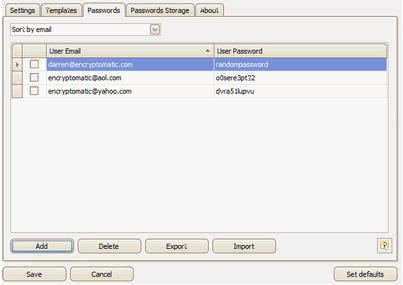 Send secure email and attachments that are viewable on any platform. Obtain peace of mind with just a single click of your mouse. Avoid the inconvenience of having your recipient install special software, or use special encryption keys. Download available for: Windows 10/8/7, and MS Outlook 2010/2013/2016/2019 (32 and 64bit) and Office 365. Microsoft .Net Framework 4.0 or later. 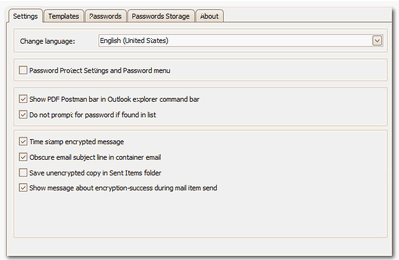 After you purchase PDF Postman for Outlook it may be used indefinitely. PDF Postman for Outlook is licensed per user, so if more people are going to use PDF Postman for Outlook you will need to purchase additional copies.